I’m a science writer by profession, but in the last few years I’ve started spending 30 minutes every day writing fiction. The first completed work was my science fiction novella “East of (h)Eden” (available from Amazon). Last week, I wrapped up the first draft of a fantasy novel, which is the biggest project I’ve undertaken since my PhD. Most fantasy novels (as opposed to science fiction, or genres that kind of blend the two) don’t make much attempt at being scientifically plausible. After all, these are worlds where magic and monsters of some sort usually exist. On the other hand, a few fantasy novels are rooted in science, or at least a flexible alternative-reality version of it—A Wrinkle in Time and A Wind in the Door by Madeleine L’Engle come to mind, along with The Fifth Season and The Obelisk Gate by N. K. Jemison. My novel, tentatively titled The Hole in the World, is definitely a fantasy, with magic and monsters. But I wanted to make the world in which it takes place a plausible one. For a number of reasons, I didn’t want the book to take place on Earth (or a typical fantasy facsimile) with human protagonists, and since I know a little bit about exoplanets, I thought I’d use some of the modern research on those to build my world. 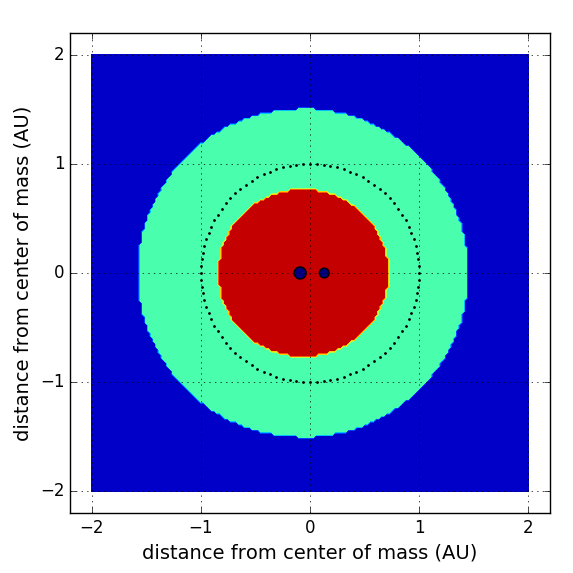 The result: the planet of The Hole in the World orbits a binary star. It also doesn’t have a moon, which lets me develop a whole mythology and culture. After all, the Sun and Moon are essential in most (if not all) Earth mythological systems, and most calendar systems. With twin suns, a whole new set of possibilities open up. But first, I had to make sure I had a scientifically workable planetary system. NB: this post doesn’t spoil any of the plot of The Hole in the World. It’s only about the astrophysics of the planetary system, which (like Tolkien’s obsessive linguistics) you don’t need to know or memorize to get through the story. If you want a brief blurb of the novel’s plot, scroll to the end of the post. The Paltarayn-ohtema-tighayn don’t have a special name for the planet they live on. Their concept of time separates history into “worlds”, which is the relevant concept for them. That word in their language is Sambke, so that’s the word I’ll use for the planet too. The star system including Sambke is known as a circumbinary: the planets in the system orbit a pair of stars, which in turn orbit each other. (Another type of system involves the stars orbiting each other on a much wider orbit, so the planets can orbit just one of the stars in the system.) To use the technical language: everything in Sambke’s system orbits the center of mass. That’s also true in the Solar System, but in our case, the center of mass lies inside the Sun, which is by far the most massive thing. That means both suns rise together in the morning and set together in the evening, though which one rises first depends on where they are in their orbit. The suns orbit far enough apart that they can be clearly seen as separate objects in the sky from Sambke most of the time. That also means Sambke is noticeably closer to one star or the other during parts of the orbit, with a resultant fluctuation in temperature and amount of sunlight. The Paltarayn-ohtema-tighayn call this the suncycle. Sambke doesn’t have strong seasonal variations like Earth, but this fluctuation in temperature over the suncycle plays a role in the growth cycle of plants—albeit a far more rapid set of fluctuations than we have on Earth. The twinsuns take about 31 days and 8 hours to complete one orbit around each other. However, because Sambke is orbiting both stars in the same direction they circle each other, they appear to take a slightly longer time to orbit. 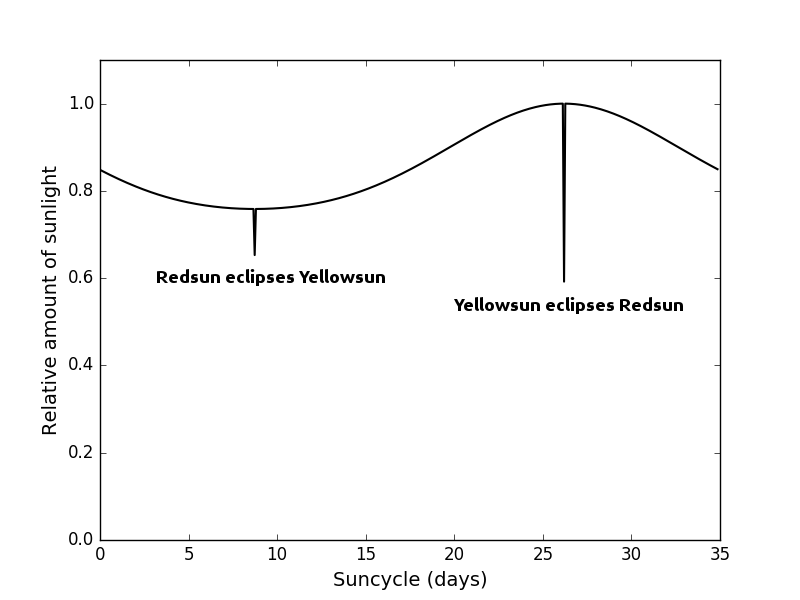 As a result, the suncycle is about 34 days and 22 hours long. Sambke doesn’t have any moons. On Earth, the length of a month (or “moonth”) is tied to the orbit of the Moon and its phases in many calendar systems. In the Gregorian calendar, this connection to the Moon is gone except in name, but in the Islamic calendar for instance, the first sliver of the new Moon is the beginning of a new month. Without a Moon, the Paltarayn-ohtema-tighayn use the suncycles in place of months. The Paltarayn-ohtema-tighayn do track and count years, though, and have a sophisticated understanding of astronomy. For instance, they’re aware the stars are suns like theirs, and other planets in their system are worlds like theirs. This is likely because they can observe the varying sizes, changes in light and temperature, and other complex sky motions because of the binary nature of their suns more easily than we can on Earth. On the other hand, their astronomical understanding doesn’t play a huge role in their mythology, for reasons this author is not qualified to comment on. In writing the text of the story, I chose to put things in terms more familiar to Earth people, particularly American Earth people. Hallen (the main character of the story) had her Coming of Age ceremony when she was 180 suncycles old. That’s roughly 21 Sambke years old, which is about 17 Earth years. Taking into account growth, aging, and cultural differences, we end up with a lovely coincidence: Paltarayn-ohtema-tighayn grow up, come of age, and have life-expectancies that correspond to when those happen for humans. A 21-year-old tighi (in Sambke years) roughly corresponds to a 21-year-old human (in Earth years), while an 80-year-old tighi is analogous to an 80-year-old human. Additionally, it’s rare for either species to live past 100 years, calculated according to the planet where they live. Sambke orbits its suns in a very nearly circular orbit, unlike Earth, which follows an elliptical orbit. (OK, that’s because I didn’t want to spend the extra time working out the astrophysics for an elliptical orbits.) The Sun only appears about 4 percent larger at Earth’s closest approach (the perihelion) than it does at farthest distance (aphelion). 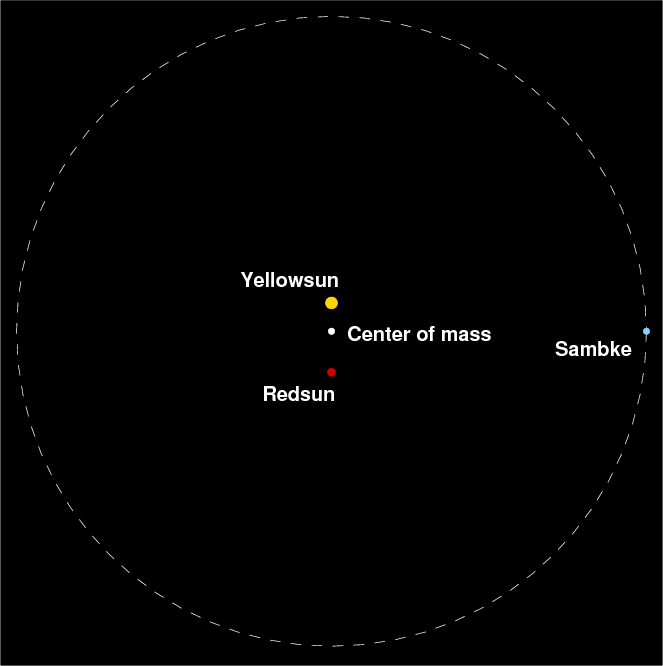 However, because Sambke’s twinsuns also orbit each other, the planet is closer to one star or the other for most of the suncycle. The Sun’s apparent size is about 0.5º, the size of an American quarter dollar held at arm’s length. When Redsun is closest to Sambke, it’s about 0.38º across, which is noticeably smaller than the Sun’s apparent size. At that same point in the orbit, Yellowsun is the farthest it gets from Sambke, and appears to be 0.46º across. When Yellowsun is closest and Redsun is farthest, they are 0.55º and 0.29º across, respectively. Those numbers aren’t very intuitive unless you’re used to thinking about angles on the sky, but the difference in apparent size of Redsun is 24% over the course of a suncycle, and the difference for Yellowsun is 16%. Once per suncycle, Redsun passes in front of Yellowsun, but since it’s smaller, it blocks only part of Yellowsun’s light. From Sambke’s surface without special eclipse-viewing equipment, Redsun would appear to be a black disc over Yellowsun, blocking about 68% of its light. That’s a big eclipse, but it only lasts about 22 minutes. Also once per suncycle, Yellowsun passes in front of Redsun, blocking all of its light. That eclipse is longer, lasting about an hour and 12 minutes. Even though Redsun is fainter, the loss of all its light makes for a deeper, more dramatic eclipse than the other type. If, like Tatooine in Star Wars, you want to just have a planetary system with a binary star that looks cool, you don’t need to go through all the steps I’ve taken. However, I wanted to create a system as realistic as possible, so I spent an embarrassing number of hours reading scientific articles and writing computer code. The key was to find an orbit for Sambke that places it in the “habitable zone”: the region of a star system where liquid water can exist on the surface of a planet, under certain assumptions about the planet’s atmosphere. I cheated by not thinking too hard about the atmosphere, which really is a cheat, because life shaped and shapes Earth’s atmosphere. Leaving my fail aside, the habitable zone for a binary star is more complicated than that of a single star, so I turned to a 2013 article in the Astrophysical Journal by Kane and Hinkel (available freely online), a 1993 article in Icarus (not freely available), and some of my graduate-school textbooks. Temperature: and (and the Sun is ), where “K” is Kelvins, the preferred scientific unit of temperature. Next, I looked at data for real circumbinary exoplanets such as Kepler-35b, and arbitrarily decided to have the suns orbit each other every 31.3 days. With ordinary celestial mechanics (a wonderful scientific term! ), I used the orbital period and masses to find the orbital parameters for the twinsuns. Specifically, Redsun is AU from the center of mass and AU from the center of mass, where 1 AU is the average distance from Earth to the Sun. Then it gets complicated: using mathematical formulas from the papers I cited above, I calculated the inner and outer edges of the habitable zone. As it turned out, an orbit the size of Earth’s would fit into this star system, so I chose Sambke to orbit at 1 AU. However, because the two stars together are more massive than the Sun, Sambke orbits more quickly than Earth, completing one year in 301.25 days. The rest is calculating how big each sun appears in the sky over the course of a suncycle using geometry, and using the relative speed each object orbits around the center of mass to determine how long a suncycle is. If there’s sufficient interest and I have enough time, I can write all this up. Hallen has chosen to be the first new Prophet for her people in over a generation, but faces hostility and resistance from the village elders. When a sudden plague of sleep falls over every village, she and her new husband Kundo-Han set out to determine what’s wrong and find the cure. With the help of the exiled Prophet Tragha, Hallen discovers the source of the problems, centered around a hole someone opened between her world and the Nightmare World. Along the way, she faces bloodthirsty ghosts, parasitical demons, waking nightmares, and—worst of all—the kind of evil that lives in ordinary people. (I feel this doesn’t quite capture the spirit of the book, but it’s OK for a first pass.) I’m currently revising the book draft, and hope to find a publisher for it when that revision is done.